Dymo 30857 Name Badge Labels are an adhesive (sticky) label that can be affixed directly to clothing. Alternatively, instead of peeling the backing sheet off the label, you can slide it into a plastic name badge holder. These Name Badge labels are manufactured by Dymo, so your warranty is safe. They are compatible with all current Dymo LabelWriter models and most recent models too. This list shows all the current and older LW models this label is compatible with. Any questions, call us or email us. JOIN OUR HOT DEALS LIST! How do I calculate shipping? © Labelcity, Inc. All rights reserved. "Labelcity" is a registered trademark of Labelcity, Inc. LabelWriter is a registered trademark of DYMO Corporation. 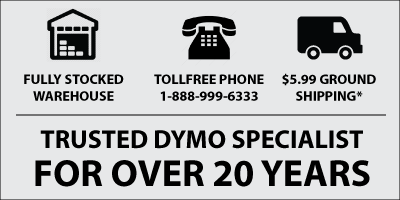 Dymo brand is a trademark of DYMO Corporation.